Welcome to The Greatest Snake – a game of extreme snake bodybuilding! If you’re looking for how to play the game, you’re in the right place. You can play this game with three to four people, unless you have the Expansion Pack that boosts it to five. If you’re looking for clarifications about specific cards and situations, skip to the bottom of the page. First things first, you have to make your snakes! When you open the game, there are 12 cards at the top that have no symbols in their top right corners, and don’t have the same backs as the rest of the cards. Separate these cards from the rest. These are the Head Cards, Tail Cards, and Fashionable Body Cards. Each player picks one of each of these types of cards. There are no functional differences between them (aside from who might go first), so choose the ones you think suit your style the best. Connect them together to form a whole (if small) snake. Place your Head Card on the awake side, and the Body and Tail Cards on whichever side you like best. Take the rest of the cards and shuffle them to form the Deck. 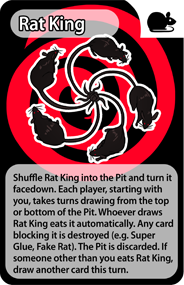 Each player draws 3 cards from the Deck, putting any Rat Cards (see Rat Cards) into the Pit (see The Pit). Keep drawing until each player has 3 cards they can keep in their hand. If one of the Rat Cards is Rat King, shuffle it back into the Deck. The player who most resembles their snake takes the first turn. You can base this on your snake’s description, face, fashion, and so on. Make a case for yourself! After the first player’s turn, play continues clockwise around the table. The first snake to reach a length of 7 cards (including head and tail) is the winner! If more than one snake manages this at the same time, it’s a tie. May the greatest snake win! Wake Up – Firstly, if your snake is asleep, wake it up by flipping its Head Card back to the awake side (see Sleeping). Draw Phase – Draw one card from the Deck without showing it to the other players. If it’s a Rat Card, you must play it face up and decide whether or not to eat it (see Rat Cards). Read its description out loud so other player’s can figure out whether they want to do anything. If you draw an Equipment Card or Power Card (see Equipment Cards and Power Cards), you may keep it in your hand as a deep dark secret for later (or play it now, I’m not stopping you). Digestion Phase – Once you’ve equipped any Equipment and played any Power Cards you wanted to, you must emphatically declare the word, “Digest!” to end your turn. 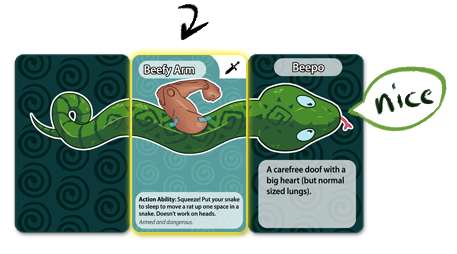 When you do, ALL players move any Rat Cards in their snake 1 space closer to their Tail Card (so, if you just ate one, it moves from the Head Card to the first Body Card). Don’t forget to do this after each player’s turn! Digestion takes place even if a snake is asleep (just like real life). If a rat passes the Tail Card, which counts as a digestion space, it is digested. 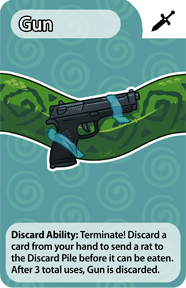 Push the Tail Card away from the rest of the snake, flip the digested rat over, and place it between the two to become the newest Body Card for the snake. The Digestion Phase happens instantly, and therefore Power Cards and Equipment Cards cannot be used until the next player’s turn. You can hold up to 7 cards in your hand, but if you end your turn with any more than that, you must discard or play some until you’re at 7 or fewer. Body Cards – A Body Card can refer to the Fashionable Body Card you start with, or any Rat Card that has been flipped over and added between the Head and Tail Cards of your snake. Rat Cards – Your snake needs to eat rats to grow longer! They’re the meat and potatoes of the game, so to speak. To eat a rat, place it above (or on top of) your snake’s Head Card. If your head is already covered (mouth is full) or you’re asleep, you can’t eat a rat. If you can’t eat it, or don’t want to, place it face up in the Pit. Rats cannot occupy the same space in a snake at the same time and may block each other depending on their digestion speeds. A faster moving rat will be blocked by a slower rat, it won’t push it through faster. 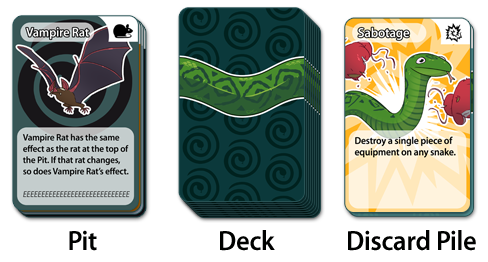 Power Cards – Power Cards are single-use cards that can be played at any time, during any player’s turn, except for the Digestion Phase! After one is used, it goes to the Discard Pile. 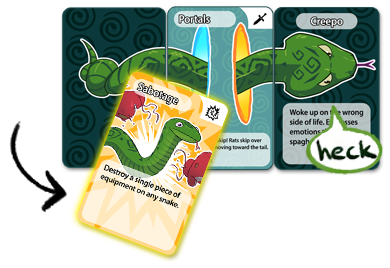 Equipment Cards – These cards can be used to give your snake sweet new abilities. 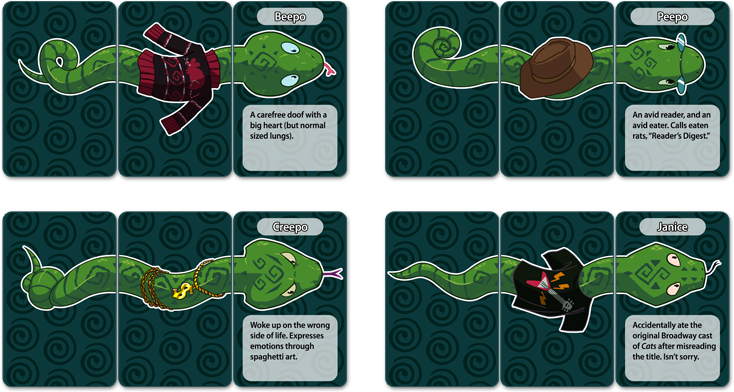 You can equip them only on your turn, by placing them directly over top of any Body Card in your snake – even the Fashionable one they start with (just not heads or tails, of course). There is no limit to how many you can equip per turn. Once equipped, they stay there until a card or effect says otherwise, or you decide to discard them. They cannot be rearranged at will, or taken back to your hand, so position them wisely. Each Equipment Card has an ability that’s either constant, or can be used at a price. These abilities can be used at any time, during any player’s turn, except for the Digestion Phase! The exception is that any ability that isn’t constant CANNOT be used if there is a rat on top of that card – it’s hard to swing a sword around with a rat inside of you! However, rats do not prevent you from playing equipment to that Body Card, or stop an opponent from stealing equipment in that spot. Some cards put your snake to sleep. 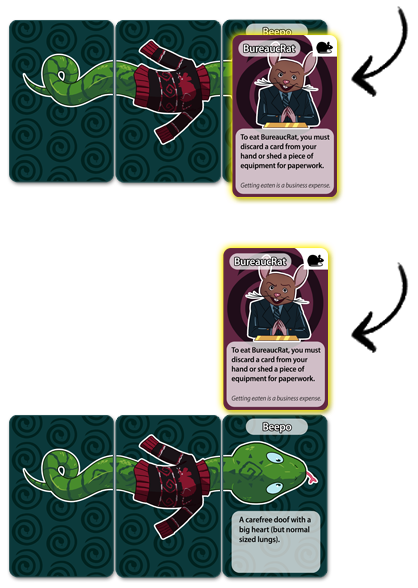 When that happens, flip your snake’s Head Card over to the comfy sleep mask side (since snakes can’t biologically close their eyes, and this game is scientifically bulletproof). Sleeping snakes cannot eat rats, though they can still digest and vomit (just like in real life). If a piece of equipment requires your snake to go to sleep to use its ability, you cannot use it if your snake is already asleep. Your snake wakes up at the beginning of your next turn. Many Equipment and Power Cards let you squeeze rats. When a rat is squeezed, it moves 1 space closer to the head. If it reaches the head, it is vomited up and goes to the Pit. If a rat is squeezed into another rat, both rats move up 1 space. A squeeze targets both a rat, and the part of the snake it’s in. If either is unsqueezable, the rat is safe. Heads cannot be squeezed by anything, but tails can. A face-up pile next to the Deck where used or destroyed cards go. Shuffle it back into the Deck if the Deck runs out of cards. A face-up pile where escaped rats go. Place it on the opposite side of the Deck as the Discard Pile to avoid confusion. Shuffle it back into the Deck if the Deck runs out of cards. Sometimes, the cards just aren’t doing you any favors. For these moments, we have the Pit-y Rule! If you are the shortest snake or tied for shortest (but at least one player is ahead), and you are not currently digesting a rat, you may choose to draw the top rat out of the Pit instead of drawing from the Deck for your Draw Phase. Rat effects are treated the same when drawn from the Pit as from the Deck, unless otherwise specified. There will be times when multiple equipment abilities and Power Cards are used to respond to each other. When this happens, the last action resolves first. For example: Player 1 tries to eat a rat, Player 2 plays Super Glue to stop them, so Player 1 plays Dodge. Player 1 dodges the Super Glue and eats the rat. However, if Player 1 had used an equipment card’s dodge ability instead of a Dodge Power Card, it would then be asleep (the cost of that equipment ability) and unable to eat the rat, because the dodging would resolve before the rat was in the snake’s mouth. Whenever a player tries to take an action in the game, the other players have an opportunity to respond to it before it fully takes effect (just try to be timely about it). You can’t rush through your turn just to prevent someone from playing something against you. Gun and Lasers Ammo: If you Steal or Swap the Equipment Card Gun, or Lasers, from another player, the number of times that card’s ability can be used does not replenish. If the player you took it from used it once, then it only has two uses left, etc. You may want to place cards used as ammo outside of the Discard Pile to keep track until Gun/Lasers is used up. Fake Rat: You are allowed to feed Fake Rat to a snake whenever you want, and that includes your own snake. We only specified playing it to stop another snake from eating a real rat in its description because we noticed first time players of the game wouldn’t always understand its main potential. 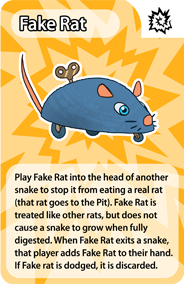 Also, the phrase, “Fake Rat is treated like other rats” means that it is essentially like a Rat Card and a Power Card at the same time, aside from its activation and what happens when it exits a snake. Cards that affect Rat Cards will affect Fake Rat the same way. Rat King: “Whoever draws Rat King eats it automatically. Any card blocking it is destroyed (e.g. Super Glue, Fake Rat).” This means that there is no way to prevent Rat King from being eaten. It will end up in that snake’s mouth no matter what, even if that snake is asleep. If another rat is in the way, it would also be destroyed. But, once eaten, Rat King can be affected in the same ways as any other rat. Did a situation come up while you were playing the game that you’d like clarified? Or maybe you have an idea for a set of house rules to play the game differently? Let us know! © 2017-2019 The Greatest Snake. All rights reserved.